Ebford, Devon October 22, 2006 As per Geoff Bowen's Pebblebed harvest report, the last of the Pebblebed grapes are all now in. Once picked, they were transported to Juliet White's Yearlstone winery, crushed and are now slowly fermenting as natural grape sugars are transformed into alcohol. In Piedmont, Mario Fontana's deeply coloured classic red wines of Le Langhe - Dolcetto, Barbera, Nebbiolo and Barolo - continue to slowly ferment. Soon it will be time to draw off the first jugs of tooth-staining Dolcetto, brought to the table direct from the cellar below, still foaming and raspingly acidic, to enjoy with bagna caoda, the pungent anchovy and garlic hot pot that is a characteristic and delicious autumn food of the region. Last Sunday's harvest in Ebford, as harvests are everywhere, was a quite joyous event. The forecast was dire, with torrential rain and high winds set to pass through in the morning. 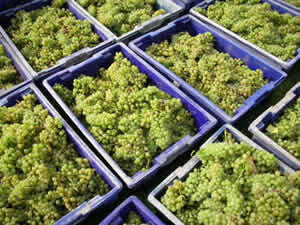 A good turnout, however, ensured that the last of the Seyval grapes were harvested by mid-morning. Then, just as the last crates were loaded on to John Pyne's horse trailers for transport to Yearlstone, the heavens opened. Everyone huddled under the marquee as the rain lashed down. The weather may have been horrid, but there was a real feeling of satisfaction at a job well done. Harvesting grapes is hard physical labour, bending down or stretching up to carefully cut the bunches, carrying the heavy crates down the rows, back up to start all over again. Yet there are rewards: at the finish, hands sticky from the sweet grape juice that ran down our arms, Geoff passed around most welcome tumblers of of Pebblebed white 2005. Now normally - Geoff I'm sure would concur - we consider Pebblebed white to be a light summer wine to enjoy on balmy evenings, perhaps beside the river. On this day, the weather by contrast was positively wintry as the rain, driven by the near gale force westerlies, lashed horizontally into the marquee, drenching and chilling us all. Yet that Pebblebed white, supped or glugged with gusto and real thirst worked up from labour and anticipation, enjoyed within the actual vineyard from which it was produced, tasted as full and delicious and as right for the occasion as any glass of wine you are ever likely to taste in your life. Bravo, Geoff, brava, Anna, bravo Bill. Let's raise a glass to Geoff and to all our winemaker friends, Mario of Cascina Fontana, Giuditta of Loretello, Donatella of Casato Prime Donne, Gianluca of Prosecco Bisol and others. Your considerable efforts bring great pleasure to us all! Last Sunday, Anna made enough soup to feed an army of hungry grape pickers. This recipe is scaled down to feed just a hungry family or two. In a separate pan, par-boil the new potatoes until just tender. Fry the onions and leeks in a generous knob of butter. Add the bacon and cook for five minutes or so. Add a glass of white wine (one for the pot, one for the cook), stir in well and let bubble for a couple of minutes. Add tomato puree, baked beans, new potatoes and cabbage and top up with water so that all the contents are just covered. Bring to the boil and simmer until the cabbage is well cooked. Add a generous splosh of Tabasco to give that final Pebblebed kick. Enjoy - either around the table or, if you really want to be authentic, standing outside in the pouring rain.